I would have polished this a bit more, but we went a different direction before I finished the comps. I love infographics. This one attempts to illustrate the relationship between Marketing and Sales with a metaphor that might be a little tired. 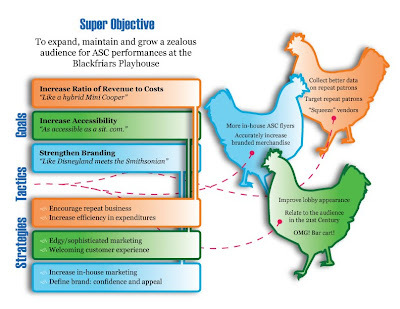 The second page is an internal goals/strategies/tactics chart to get our department on one page and creatively portray our vision to the rest of the company. In the end, this is a rough draft. Don't be too critical, please. 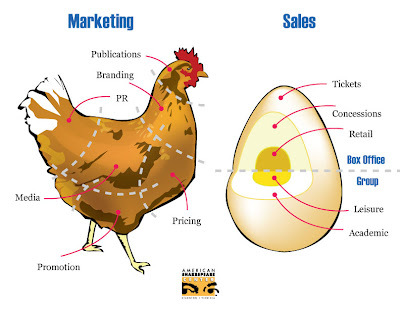 I'm proud of my Adobe Illustrator skills on that chicken and egg, though.